A cautionary tale. Be careful how you write your menus. I love this menu. A classic example of why you should be very careful when writing menus. 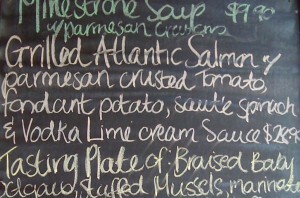 People are lazy readers and handwriting on a blackboard can have legibility issues. We chose to settle for cocktails and ate at home.